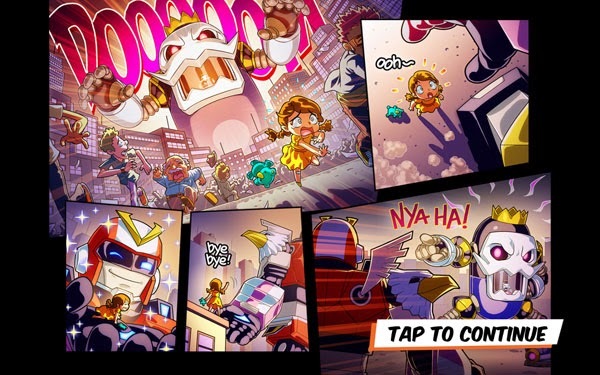 The project’s name is Run Run Super V. As a game developer myself, this looks like a dream project. I hate free-to-play (F2P) games with a passion I can’t even begin to describe, but this is one of those rare F2P gems I would not mind creating or playing. One look at the title screen and you can definitely see that the devs had a lot of fun making this game. 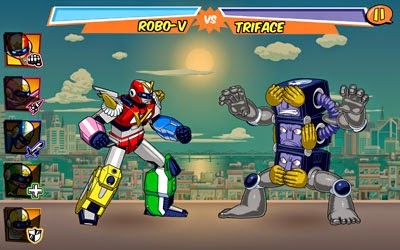 Then you go into a turn-based fighting game. 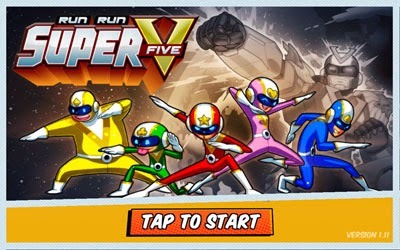 Run Run Super V is actually still in alpha phase but hot damn if it isn’t one of the most polished games in alpha phase I’ve ever seen. Aaaand I cannot resist adding another screen shot of a cut scene here. The art makes me drool. Before you can fight higher leveled giant monsters (kaiju? ), you will have to level up as well. You have the option of going to the world map and checking out other things to do…such as running. Before I go to the running part, let me just say that I love this world map. The globe is 3D and you can rotate it. The running part actually has an endless platformer type of gameplay. The controls are fairly easy, though I find attacking tricky. You need to tap the right side of the screen to attack…I tend to forget that part of the instructions and I end up swiping at the enemies themselves. And then making fatal mistakes. I couldn’t take a screenshot while playing (I die!!!) so this is the best I can do.